The European Commission launches competition law investigations based on complaints. The complaint in the comparison shopping case first came from a UK shopping comparison site called Foundem and took seven years to reach the announcement of the fine. European and US competition laws are quite similar. When there is a major case that seems to violate competition law on both sides of the Atlantic, the US Department of Justice and the European Commission can agree which of them will pursue the case. This avoids companies having to duplicate legal and other resources, so is a good thing. I do not know factually whether the DOJ made such an agreement for these cases, but they did so for the very similar case I was involved in. The general legal principle that matters here is that a company that is dominant in one market is not allowed to use that dominance to decrease competition in a different market. For European Commission cases, the rule of thumb for ‘dominance’ is a 40% market share. The US Department of Justice uses the same rule of thumb when using the Sherman Act for prosecutions. The Sherman Act is over a hundred years old and the 40% principle for dominance was established something like 80 years ago. The way the Commission decides that a market exists is simply by observing the existence (or not) of competitors who are active in that space alone. It was easy for the Commission to observe that www.foundem.co.uk and other similar sites competed to earn money in the UK comparison shopping site market. So the separate market exists. The market was fragmented and nobody was ‘dominant’. Since Google had over 40% share of the search market, they were therefore forbidden from using their search dominance to squash competitors in the comparison shopping site market. The easiest way of avoiding the competition law issue would have been for Google to publish ‘independently objective criteria’ for how shopping price comparison search results would display, and ensure that the same criteria applied to both themselves and to the large number of small competitors in this new market. Google did not do this. Trying to claim that you are not dominant in search when you have over 40% market share is pointless. Claiming that the result of your business tactics do not harm consumers is also pointless, as the consumers were not the ones who complained. US anti-trust cases have focused on complaints from consumers for the last twenty or thirty years. Complaints from competitors exist but have not been pursued as aggressively. I have the impression that this is changing, as of April 2019. Since the Commission cases always take a long time, the correct way for companies to address competition law issues is to modify their business practices during that period. It then becomes relevant to take the following position: “While we do not agree with your interpretation of competition law, we have now changed our business practices, so there is no need to continue the case.” Of course that all needs to be true. The tactic described in point number 13 is what we used when I was the business leader assigned to the European Commission’s case against Digital Equipment Corporation. The case was about hardware maintenance. The Commission contended that the price discounts we gave when customers bought hardware and software maintenance together made it impossible for third party hardware maintenance companies to compete with us. The Commission defined the maintenance of DEC hardware as a market, based on the fact that there were companies who did only that. We changed our business practices, made them transparent to customers and competitors, and were able to negotiate a settlement with the commission and the plaintiff that meant we had no fine to pay. We simply had to commit to continue the new business practices. Google could have adopted the same tactic, but did not. I don’t know why. They have no chance at all of winning the legal case if they lodge an appeal. I suppose the fine could be changed, up or down. OK, one final anecdote. Just after the DEC case, the Commission started the browser case against Microsoft, with Netscape as the main plaintiff. I was headhunted and interviewed by Microsoft to run licensing operations in Europe and work on the case. During the interview with the corporate head of licensing, he asked me what the probability was that Microsoft could win the case. I told him it was 0%, and why. He told me that while both he and the legal team tended to agree, Bill Gates did not, so he could not hire me. Of course Microsoft lost. The principles of the loss were the same as in the current Google cases. I was the first non-lawyer to be published in a particular legal journal (Tolley’s Communication Law) on this sort of case, I believe my explanations are accurate. That’s all I want to say on the subject for now. If you believe my explanations are out of date or wrong in some way, feel free to comment below and I will correct or remove this article if necessary. Should we be surprised by the positions of the three social media businesses here? Great employment conditions and the fact that the customers seem to hate them is not really a major source of concern. We could debate whether the US consumers answering the ACSI feedback requests are actually the customers. After all, the companies’ main source of income is from advertisers, who were not asked. As for United Airlines, I think the few high-profile nasty incidents they had with passengers last year and in 2017 made a difference to perceptions. They had the biggest drop of any airline. My prediction is that it will all be forgotten in 2019 and they will have the biggest improvement. And there is just a single company in the opposite category. 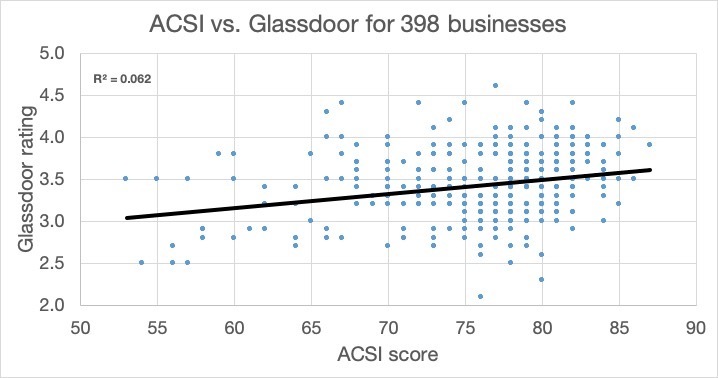 Kraft Heinz employees give them an appalling Glassdoor score of 2.9, while customers give them an ACSI score of 82. I think it is safe to say that Kraft Heinz employees have a lot to deal with these days and never come into contact with end consumers. Note that the list is in the order of the Glassdoor rankings. Hilton topped the ACSI list for hotels for the fourth year in a row, and their employees love them too. Do you see anything surprising here? I don’t. Should we be surprised to see the lower table almost exclusively populated by ISPs and TV service providers? I think not. Telecommunications companies have a reputation for disdain of both customers and employees. No, the comparisons are not fair, at least as far as customer satisfaction is concerned. 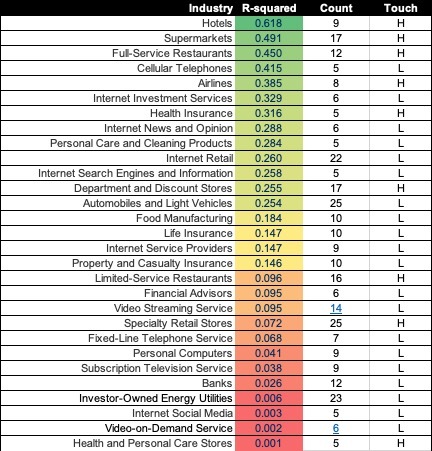 Customer satisfaction varies strongly by industry. There are industries, such as telcos, cable TV companies, and Internet Service Providers, that have little or no opportunities to ‘delight’ us. If they do their jobs perfectly, we simply don’t notice them. We only notice them when things go wrong. So it is to be expected that they would do relatively poorly in customer satisfaction comparisons that cross industry lines. However, that is no reason for them to treat their employees badly. We should not find the lack of a strong relationship between employee and customer happiness very surprising, for two main reasons. First, a company’s products and services are generally far more important to customers than the employees. The main exception to this rule is where the employees are the product. Second, employee happiness and employee engagement are two quite different concepts. Employees can be happy with their pay, the food in the company restaurant, and their commute to work. None of these do anything for customers. I have put an Excel sheet with the data here. There are four tabs. It is not very pretty. I have inspected it in various ways but may still have made some sort of error. If you find one, please let me know. If you enjoy this sort of thing, there is lots more on this topic and many others in our book Customer Experience Strategy – Design and Implementation. All of our books are available in paperback and Kindle formats from Amazon stores worldwide. In reality, I don’t believe employee satisfaction even makes the top three for most businesses. And I think I can prove it. This is the third year in a row that I have studied the relationship between customer and employee satisfaction for large companies that sell to US consumers. The results have been consistent: There is almost no relationship between employee and customer satisfaction across the 398 business covered this year. Employee satisfaction explains just 6% of the variation in customer satisfaction across these companies. Mind you, “Almost no relationship” is better than my findings in 2017, which were simply that there was, on average, no relationship. Within the overall results there are exceptions and surprises. There are industries and entire sectors where employee satisfaction matters a lot more. There are also striking examples of companies whose employees hate them while their customers love them. The opposite is also true. And these are big names. Back in 2017 I asked myself whether there was any actual evidence for the many statements that I could find that were similar to those at the top of this article. What I found was highly disappointing, to say the least. 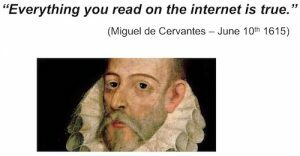 I found low-volume studies. I found attractive anecdotal studies based on single companies. I found low-volume and single-company studies about employee engagement, which is a different subject. More on employee engagement later. In short, the whole subject had not been studied scientifically. Repeating my searches before writing this article gave the same result. Nothing useful. At the top level and across all businesses, variations in employee satisfaction explain 6.2% of the variations in customer satisfaction. However, I somewhat arbitrarily decided that 129 of these businesses, such as hotels, retail stores and airlines, are ‘high-touch’. By this I mean that employees have regular face-to-face contact with customers, where their smiles and empathy may make a difference. The remaining 269 are ‘low-touch’. I have used quadratic regression for the graphs below and think they are interesting. 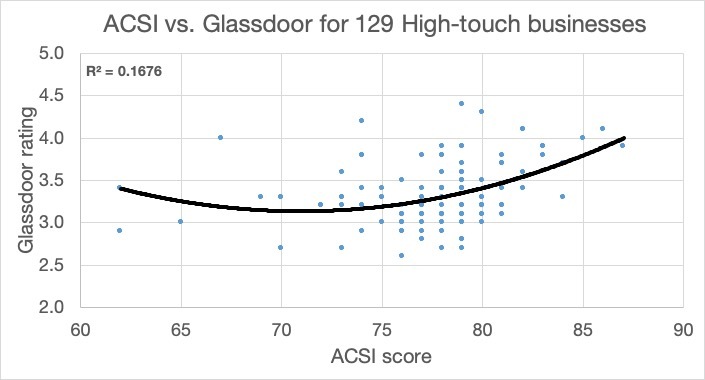 For the high-touch businesses, variations in employee satisfaction explain 16.8% of the variations in customer satisfaction. Among well-represented industries, the nine hotel chains top the list at 61.8%, followed by 17 supermarket chains at 49.1%. 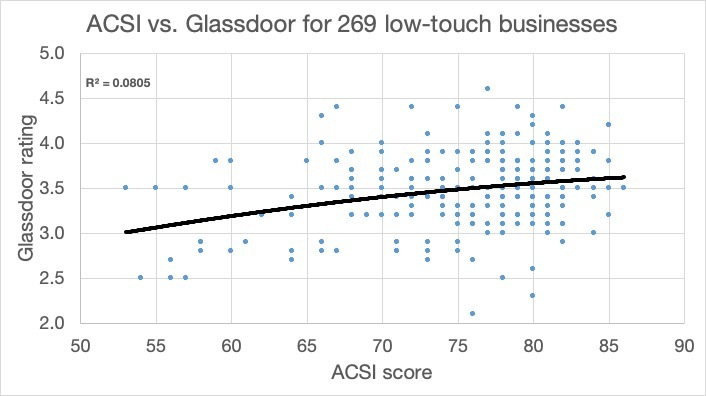 At the other end of the scale, low-touch industries have an average of 8% interdependency between employee and customer satisfaction. The energy utilities industry is represented by 23 companies and shows no relationship at all. I don’t find this surprising. When was the last time you spoke face-to-face with an energy company employee? In my own case, they don’t even need to come out to read our meters anymore. Retail does rather worse than last year. While it might be tempting to say that this is because Internet Retail is now included in Retail, that’s not the problem. Health and Personal Care stores now have no relationship between employee and customer satisfaction. I removed all industries represented by less than five businesses from the table below. This may not be entirely fair. After all, if there are only three large businesses in a particular industry in the USA, the ‘Normal distribution’ rules of statistics don’t apply. If there are only three and you cover them all, you have a good sample. Similarly, there simply aren’t 30 major hotel businesses in the USA, so any preconception you may have that you need a minimum of 30 for a valid sample is simply wrong. In any case, you will be able to make your own judgments when you download the data. It should not surprise you to see hotels, supermarkets and restaurants at the top of this list. For hotels, employee satisfaction variation explains 61.8% of the variation in customer satisfaction. Employees are an integral part of the experience in these industries. For many of the industries close to the bottom, we never come into face-to-face contact with the employees, so the lack of a relationship between employee and customer satisfaction should not be a surprise either. This is part one. What’s next? This is the first instalment. Here is a link to the data so you can download it and do your own analysis. Note that the Excel sheet has four tabs. In the next article I will cover the companies that employees love while customers hate them, and vice-versa. I believe these lists will be quite enlightening and will make it seem more logical that employee and customer satisfaction do not necessarily go together. I will also provide details of the companies that are at the top of both lists, and of course the opposite. I also go on to suggest why these results should not be a surprise.